New Orleans guitarist Jeff Chaz has bounced back from the turmoil created from the aftermath of Hurricane Katrina in his native state (he was forced to evacuate to Florida, and was unable to return for months), plus other serious personal battles that ensued. The Bourbon Street Blues Man is still performing, however, and is working to issue a brand new release of all original material in the near future. Sadly, all of Chaz’s previously released albums are out of print at this time. Happily, Chaz has recently released Chronicles (JCP/Select-O-Hits), a wonderful compilation of the finest moments from his previous releases. There are two tracks from his 2001 debut, Tired of Being Lonely (the soulful title track and the slow blues “Seafood Dept. Blues”), five from 2003’s Cookin’ In Old Grease (the smoldering “Instrument of Pleasure,” the slick shuffle “I’ve Got To Be Clean,” the funky “Morning Coffee,” the catchy “The Scent of a Woman,” which should have been a hit, and “Don’t Go Monkeyin’ Around”, a rocking duet with Tomato), and three from 2006’s In Exile (“Dreams Don’t Lie,” a deep soul number, the rocker “Hello Blues,” and the aptly-titled “I Smell Something Funky”). All of Chaz’s previous releases were marvelous, but Chronicles really captures the essence of his music…tough, high-energy guitar with blues, funk, and rock influences, and fiery vocals that can easily handle gritty blues, silky soul, or funky R&B, and a knack for clever, imaginative songwriting (he wrote all ten songs on this collection). There are flashes of Albert King and Roy Buchanan in his guitar work, but I also hear a bit of Bobby Parker both in his passionate singing and his diverse string-bending. 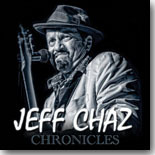 If you’re not familiar with Jeff Chaz, Chronicles is the best place to get the whole picture, but do try to track down his earlier recordings if at all possible. They’re good from start to finish. Hopefully, he will be back soon with some new music.